Mike Waggoner and the Bops werde a regional Minneapolis, Minnesota, rock'n'roll group. 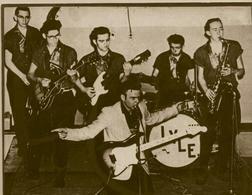 The band was led by Mike Waggoner, seen in the front in the image. His first love was rockabilly and during the 1960s, the Bops were pretty successful around the Minneapolis area. In the early 1960s, Waggoner and the Bops went into the studio to cut their first (and only) single. Dale Hawkins' "Baby Baby" and the instrumental "Basher #5" was released in April 1961 on the local Vee label and was a hit record in the area. 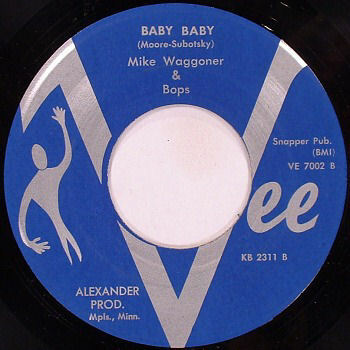 There were several other recordings by Waggoner and the Bops, but none of these were issued originally. For example, they recorded a great cover of Chuck Berry's "Bye Bye Johnny" and the rockin' "Coming Up". In 1964, the Bops were the opening act for the Rolling Stones at their first concert in Minneapolis. Later in the sixties, Waggoner changed his style to pop music, then to rock music in the 1970s and recently returned to rock'n'roll and rockabilly. He plays with a band called "Memphis Trax" in the Minneapolis-Saint Paul area. Mike Waggoner and the Bops were inducted into the Midwest Music Hall of Fame in 2008. Much of the band's recordings were issued in 1983 on the White Label LP "Minnesota Rock-a-Billy-Rock, Volume 4". Hey, Thanks for the Minnesota record. I live in St. Paul, and will keep my eye out for this guy.